As I’ve mentioned before, I’m not a huge fan of Los Angeles. Slowly, my opinion has been changing, and recently, a trip to Pasadena has totally changed my mind. You see, Pasadena is the oldest of LA’s 88 suburbs – it was founded by wealthy mid-westerns who saw how the city of Los Angeles was growing and decided to get their own slice of sunshine. Old Pasadena and its surrounds are famous for the annual Rose Bowl Parade, but I found that there is plenty to see and do around town. Pasadena is in the Northeast part of LA, just in the shadow of the mountains, with the skyline of LA very faint in the distance. Here are a few recommendations of what I loved the most; whether you choose to actually stay in Pasadena during your visit or just come up from other parts of LA for the day, you’ll definitely be pleased you did. The Gamble House: The Gambles are the family behind the corporate brand Proctor and Gamble. This home is perhaps the most beautiful home I have ever seen – exquisite woodwork, perfectly matched rugs and paintings, and a generous layout that would have been the talk of the town when it was built. 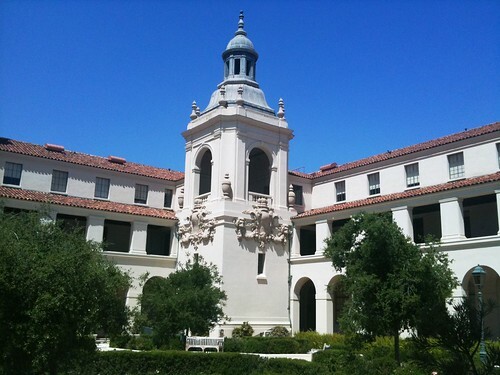 Guided tours are very interesting and offer a good glimpse into Pasadena history. Norton Simon Museum: A great museum with an overview of each major century of art. Love their outdoor garden and cafe. Huntington Library & Gardens: This massive estate (pictured above) is just a few miles outside of Pasadena and is simply stunning. It seems like their elaborate and well-kept grounds go on for miles, and along the way there are wonderful art galleries and exhibition halls. Impressive. California is well known for food, and Pasadena is one of the culinary hot spots of the state – a prestigious cooking school and over 500 restaurants are just partly evidence. Just sample some eats from any of these restaurants and you’ll be ready to come back to Pasadena just to eat! Choza Mama: This is a family owned Peruvian restaurant on Colorado Boulevard. The authentic dishes are piled high, and so is the bread and dipping sauces, so don’t come here unless it’s on an empty stomach. Friendly staff and flavourful, spicy dishes await – I can’t make a specific recommendation, because everything is so yummy. Elements Kitchen: This is a restaurant/bar situated just next door to the Pasadena Playhouse, so if you’re in the mood for food + theatre, you can get both all in one evening. We went for brunch and had their tasty chicken and waffles, which are apparently a classic LA dish (I had no idea). The menu is eclectic and has plenty of options for whatever you might be hungry for. If you want to do a food tour while in Pasadena, I very highly recommended the kind folks at Melting Pot Tours. Their tour is very comprehensive and hits all of the best locally owned establishments. Have you been to Pasadena? What were your recommendations? Hello, I live in Pasadena so I was interested to see what you thought. Glad you liked it here. 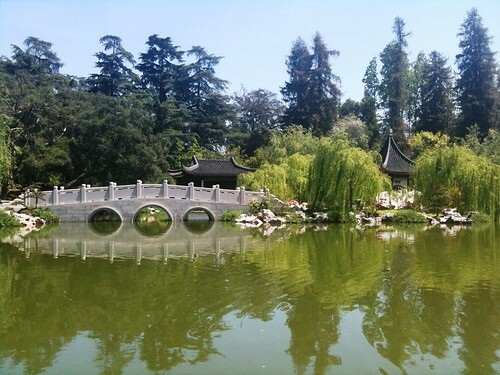 One error, the Huntington Library and Gardens is still in the city of Pasadena. I would also recommend visiting the campus of the California Institute of Technology. A small but beautiful campus. 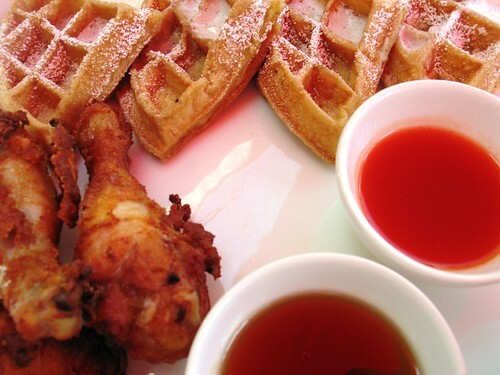 And chicken and waffles are most famous at a restaurant called Roscoe’s that is located in Pasadena. I’d also recommend eating at Europane (two locations in Pasadena now); they are famous for their open faced egg-salad sandwich and I love their macarons. And you won’t want to miss hanging out in the evening in Old Town Pasadena, where Choza Mama is located. I was born and raised in Pasadena. The parade is not called “The Rose Bowl Parade.” It is the Rose Parade. Just thought you’d like to know. We have relations living in Pasadena and friends living in Glendora. In September we are staying about half way between the two and will be visiting them, so your remarks will be useful. We have been to Pasadena, but only for a few hours and we realised that it is a rather beautiful area – so we are looking forward to seeing more of it.